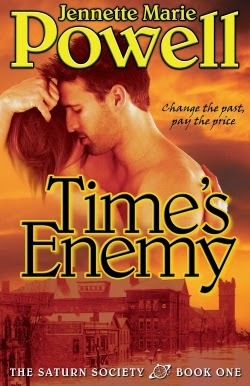 Thanks to a tip from a Galaxy Express passenger, I learned about two science-based time travel romances by Jennette Marie Powell: TIME'S ENEMY (Saturn Society #1) and TIME'S FUGITIVE (Saturn Society #2). "My other car is a DeLorean"
...so you'd think I would have run across them earlier, but nope. The search for SFR style time travel romances is especially fraught with difficulty because most time travel romances to date are supernatural in nature. So readers interested in scientifically based ones have to do lots of digging. Here are the covers and blurbs for TIME'S ENEMY and TIME'S FUGITIVE so you can learn more about them! Tony Solomon never wanted to be a time traveler. But when a freak accident gifts him with the ability to travel in time, he becomes an unwilling initiate in the Saturn Society, a secret society of time travelers. Determined to prevent his daughter’s murder, he violates the Society’s highest law and becomes a fugitive. But the Society refuses to tell Tony how to time-travel within his own life, so he seeks help from Charlotte, the woman whose life he saved during a prior trip to the past. Connect with Jennette Marie Powell on Twitter (jenmariepowell), Google+, and Facebook.